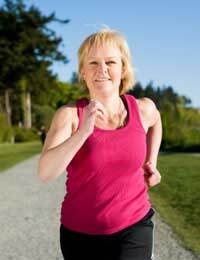 Osteoarthritis or arthritis, as it is commonly called, is one of the banes of ageing. Also known as degenerative joint disease, it is caused by wear and tear to the cartilage which normally cushions joints and a decrease in or loss of the synobial fluid which lubricates those joints – all leading to inflammation and pain in the joints. This pain is especially apparent when the joint to forced to bear weight, such as when you stand and walk. In a vicious circle syndrome, the pain often causes reluctance towards movement, leading to atrophy of regional muscles and weakening of the surrounding ligaments – and ultimately, further reduction in the function and movement of the affected joint. While osteoarthritis can be due to a primary cause, it is often the result of general wear and tear and takes time to develop, so it is one of the signs of an ageing body. However, like many other symptoms of ageing, it is possible to slow down or even prevent arthritis and joint degeneration through a few simple healthy habits. 1)	Check your alignment – many people don’t realise their bodies have a natural misalignment which can throw them off balance and make certain joints more prone to stress and damage. Check with a specialist physician or a physiotherapist and see if your spine and other limbs are correctly positioned. It may be that one of your legs is slightly longer than the other, for example, (a common problem) in which case you may need to have custom-made shoes to counteract the problem. 2)	Regular exercise – we all know that regular exercise is important for your general health and fitness; now add another benefit: moderate activity for just half an hour a day will help greatly in preventing stiffness, aches and pains. Using your joints regularly but carefully is the key to keeping them in good condition. 3)	Sit properly – many people sit terribly and have become so used to their bad postures that they are not aware of the stresses they are placing on their joints and their skeleton. Try to sit squarely on your chair, with both feet flat on the ground. Try to avoid crossing your legs if possible as this pulls your spine out of alignment and also hinders your blood circulation. 4)	Maintain a healthy weight – remember, for every pound you lose, this correlates to a 4 pound reduction in the load that each step you take exerts on your knees. Therefore, if you are overweight, losing your excess weight can make a huge difference to your chances of developing arthritis. 5)	Eat the right foods – choose foods that are high in glucosamine and chondroitin, two substances that orthopaedic surgeons believe can slow the degeneration of cartilage and maybe even repair damaged cartilage. They will also help in long-term pain relief, which can release you from taking potentially harmful pain medication. Foods high in vitamin E are also recommended as studies have found that this vitamin reduces morning stiffness and pain, as well as improving the grip strength. Fish oil is a good preventative for cartilage damage so include lots of oily fish in your diet. Green tea contains high levels of antioxidants and it also contains polyphenols called “catechins” which have been shown to prevent arthritis in mice and significantly reduce cartilage damage in humans. 6)	Quit smoking – if you need another reason to add to the long list, bear in mind that scientific studies show that smoking seriously reduces your circulation and slows healing, thereby increasing your risk of joint damage and pain. 7)	Wear sensible shoes – try to save the high heels for special occasions as they place terrible stress on the knees and significantly weakens your joints over time. In general, the lower the heel, the better for your health and fitness. 8)	Be careful when bending and lifting – remember to always bend at the knees, NOT at the back and keep your centre of gravity firmly in the centre of your body. Carry any heavy weights close to your body as this puts less strain on your back. Remember, just by a few simple changes to your diet and daily lifestyle, you can do a lot to keep your joints young and help prevent the onset of arthritis.